Baroness Van Wrangell; Sotheby's London, 26 November 1970, lot 67. A. Morassi, Guardi, Tutti i Disegni, Venice, 1975, p. 173. Geneva, Musée d'Art et d'Histoire, Art Vénitien en Suisse et au Liechtenstein, 1978, no. 176. Brussels, Palais des Beaux-Arts, Dessins Vénitiens du XVIIIème siècle, 1983, no. 107. Related to a picture formerly belonging to Lady Leyton and now in a private collection, New York, A. Morassi, Guardi, I Dipinti, Venice, 1984, I, no. 782, fig. 713. A drawing of the same composition was with Cailleux in 1971, while another without figures is in the Boymans-van Beuningen Museum, Rotterdam, and a third in the Museo Correr, A. Morassi, Tutti i Disegni, Venice, 1975, (respectively) nos. 542, 544, and 573, illustrated. 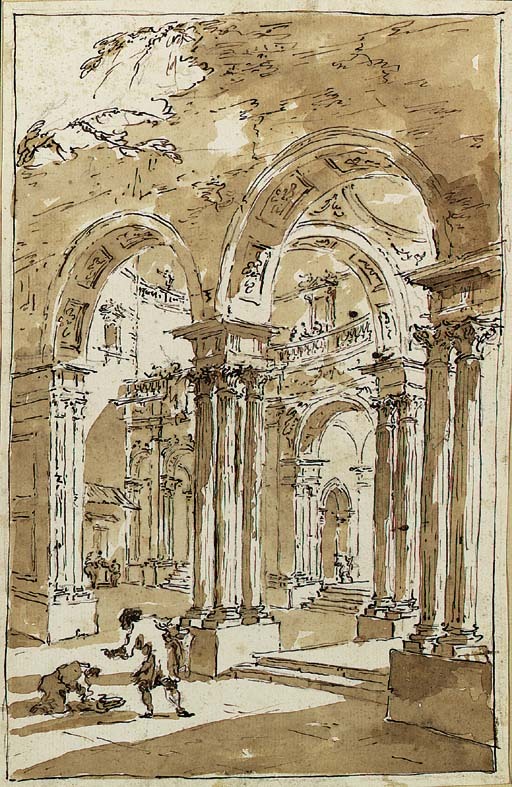 The composition was later re-used by Giacomo in a drawing exhibited at Springfield, Museum of Fine Arts, Francesco Guardi, 1937, no. 46.